In fifteen-year-old Alyssa Bondar's Russian-Jewish culture, having a few drinks is as traditional as blinchiki and piroshki. So when her mom's midday cocktails turn into an all-day happy hour, it seems like Alyssa's the only one who notices—or cares. Her dad is steeped in the nightly news—and denial—and her best friend Lana is too busy trashing their shared Russian heritage so she can be popular. Alyssa would rather focus on cross-country meets and her first kiss with her running partner, Keith, but someone has to clean up her mom's mess. But who will be there to catch Alyssa when her mom's next fall off the wagon threatens to drag her down, too? 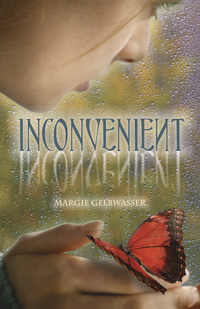 Enter for you chance to win a copy of INCONVENIENT by Margi Gelbwasser. 3. Giveaway will end December 10th. A winner will be chosen at random using random.org. 4. Fill out this FORM to Enter, do not enter in comments but comments are welcome! Thanks for the chance to win! It sounds like a good read. Also, loving the holiday blog theme. It is inspiring me to decorate my blog for the holidays!